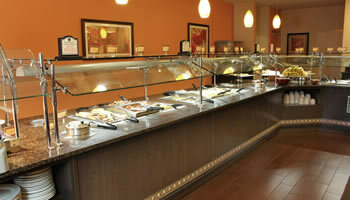 Rosen Inn International will satisfy your taste for good food at a great value. Enjoy all-you-can-eat buffets, perfect deli selections, fresh made-to-order pizza, favorite lounge beverages, and a late-night bar menu. 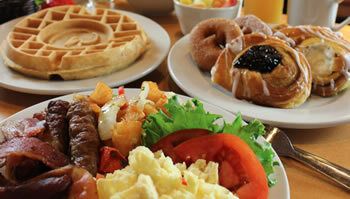 A delightful setting to enjoy elaborate buffets for breakfast or dinner. Our signature R-Rosen logo waffles and evening ice-cream bar make dining with us truly an experience. Evening menu changes nightly. If you desire something unique, a full food and alcohol menu is available, including our hot and fresh specialty pizzas. Dinner – 5:30 p.m. to 9:00 p.m. Enjoy your favorite beer, wine, or spirit in the relaxed atmosphere at Topsy Turvey Lounge, located just off the lobby. Meet with friends for drinks or grab a burger and fries or pizza while watching the big game on one of our 11 HDTVs. Now you can relax outside on the newly built patio deck. Service outside starts at 5:30 p.m. Featuring nightly happy hour drink specials and lively karaoke nights. Grille menu is available for eat-in or carry out. Open daily from 5 p.m. until late. Open from 6 a.m. until midnight for your convenience! The deli carries items such as fresh sub sandwiches, salads, chicken tenders, wings, and hot dogs, as well as a full range of bakery goods, snack items, and beverages of all kinds. They also carry convenience items to replace articles you may have left at home. While you are here try our own specialty pizza Rosen’s Perfect Pizza made with a whole wheat crust, turkey pepperoni, and low-fat mozzarella cheese. Our pizza goes perfectly with our own specialty beer Alligator Drool. Available in Topsy Turvey Lounge, Fountain View Restaurant, and Lite Bite.